In 1895 George Calder Jr. (1830-1897), a prominent businessman and inventor of Lancaster, Pennsylvania, obtained a patent for cash register and indicator (US patent 543980). 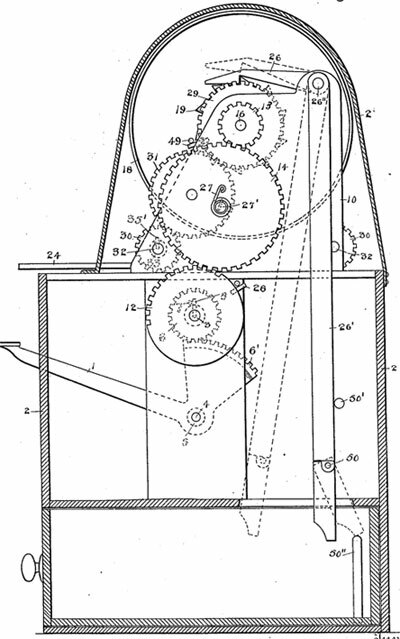 Let's examine in short the calculating machine of George Calder, using the patent drawing (see the image below). The numeral wheels are four in number and correspond to units, tens, hundreds, and thousands. The mechanism can be used for registering and adding pounds, shillings, and pence, or any denominations of currency or measure having a determinate relative value, by suitably engaging the teeth in the various gears and otherwise modifying the parts in usual manner. If the units-wheel 18 has been rotated three times, 3 will be indicated on the tens-wheel 40', said wheel having been moved three times by three complete rotations of shaft 24 and wheel 40, each movement of wheel 40' being the tenth of a rotation. If, however, tens are to be indicated by the second or tens wheel 18—for example, three dimes—the second key and lever 24 and the corresponding wheel 18 will be moved, which will have the effect to move the second shaft 34 and numeral-wheel 40' three-tenths of a rotation and so as to indicate 3, and this is effected without the intermediate agency of the first shaft 34 and its operating-bar. At the end of the business day or at any time desired the several numeral wheels can be set at zero by means of the shafts 34, which project through plate 39' for the purpose. Who was the inventor—George Calder? George (Edward) Calder Jr. was born on 28 May, 1830, in Boston, the oldest son of George and Martha Ann Calder (born Leland). George Calder Sr. (born on 29 November 1799, in Gloucester, Essex, MA) was a prominent Lancaster businessman, who had charge of and ran steamboats from Lancaster to Philadelphia in 1840s, later was a coal merchant. He was 4th generation heir of Dr. Robert Calder (1692-1746), born in Scotland, who emigrated in America in 1710 and was a surgeon at the Royal Navy. George Calder Sr. died on 21 July 1884, in Lancaster. On 6 December 1827, in New York, George Calder Sr. married the young Martha Ann Leland (born on 15 April, 1809, in Boston, MA, died 4 August 1903, in Lancaster), daughter of Lewis Leland and Martha (Patty) Smith. The family had (besides George Jr.) three daughters—Martha Ann (1828-1875), Mary (b. 1832), Euphrasia Emiline (1836-1911), and four younger sons—William (1831-1847), Francis Leland (1838-1913), Lewis Augustus (1840-1841), and Lewis H. (1843-1866). George Calder Jr. removed with his parents to New York when a child, afterwards for several years to Montevideo (in late 1830s), South America, and then returned in 1840 to Lancaster. When eighteen years old he went to California in late 1840s and accumulated a small fortune. In early 1850s he worked as a clerk in California and came back to Lancaster around 1852, and has since resided there. In 1862 George Calder enrolled 79th Pennsylvania Volunteer Infantry and took part in the Civil War. George Calder was for several years in the employ of his father as a coal merchant, then started his own business. In 1866 he built a cotton mill in Lancaster and continued the business until 1889. In 1892 he started another cotton mill in Lancaster. He was also the owner of a cotton mill in Harrisburg, which he operated for ten years. He was for fifteen years the proprietor of a dye house, which was operated in connection with his mills. George Calder was a mechanical genius, and besides the above-mentioned patent for calculating machine, he was a holder of several patents for matrix-making machines. He had the first telephone in Lancaster. George Calder was engaged in charity, he was on the Board of Trustees of the Yeates Institute (institution for education of poor young men for the ministry), and in 1859 one of the incorporators of the Home for Friendless Children. George Calder married Mary Maris Hurford, daughter of Lewis Hurford and Sarah Downing Couch, on 28 April 1863, in Lancaster, PA. Mary Maris was born on 23 May 1838 at Lancaster, PA., and died on 21 April 1928 at Lancaster. They had 6 children: Ellen Ellery (1865-1902), George Hurford (1867-1935), William Ellery (1870-1920), Mary Hurford (1872-1958), Edward (1875-1944), and Stewart Wilson (1878-1920). George Calder Jr. died at age 66 at his residence in Lancaster on 11 March, 1897. The cause of death was dropsy and kidney trouble. He was buried at Woodward Hill Cemetery.